Prayer is an every day, every moment activity. It is my constant connection with God through the hills and valleys of life. I know that God certainly listens to every word of prayer I lift up to Him. In my personal life, my wife Sue and I take time every day to hear the heart of God. Whether we are together face-to-face or with the help of digital tools, our commitment to this habit remains steadfast. I have noticed that God has used these daily moments to grow Himself in me… His vision for my life; His heart for those around me; More of Jesus in me. Listening intently to the Father’s heart as His child is a daily display of Christlike character. There is an exponential effect when corporate prayer is released. I think of just recently how my covenant brother, Lou Engle, brought worldwide leaders together for “Rise Up,” The Call women’s prayer gathering in Washington, D.C. near the steps of the Capitol Building. Heaven was loosed in the US capital as worship and prayer filled the National Mall. 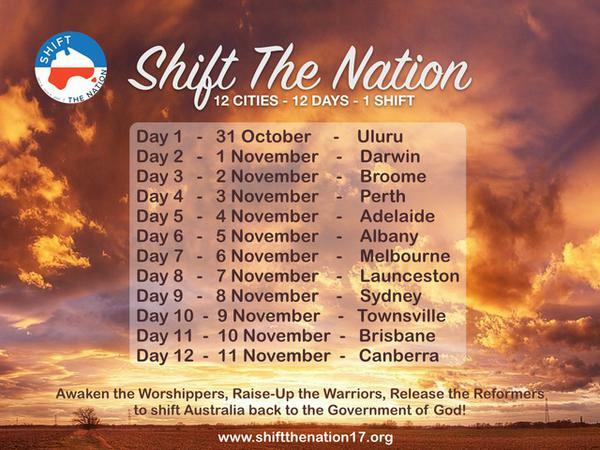 In my recent ministry time in Australia, I could feel the holy expectation for God as fellow HIM pastors are gearing up for a national prayer gathering of their own called, “Shift the Nation.” 12 days in 12 cities, from October 31st to November 11th. They are united in prayer and preparation for revival and reformation in their nation. for revival and reformation nationwide. I am believing for a mighty move of God in Australia and the US, from coast to coast. These large prayer events that usher in worldwide intercession is bringing us into deeper levels of the Spirit. Prayer prepares us for the Presence of God! Let us come together and pray. Not for a moment, but with diligence daily. WANT TO HAVE CHÉ AHN COME TO YOUR CHURCH OR EVENT?